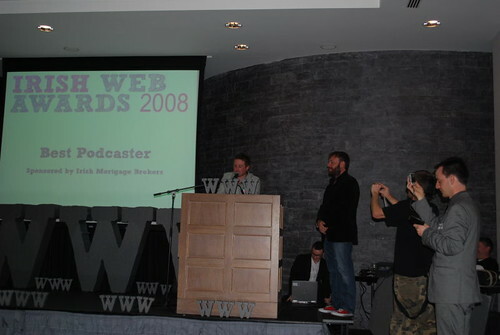 So last night in Dublin myself, Costigan and 298 other people (maybe a few more or less) turned out for the 2008 Moviestar.ie Irish Web Awards. While we had made plans to attend long before the longlists and shortlists were announced, it was nice also nice to be represented in two categories – myself as Best Podcaster with Playlist Mix (weekly on a Tuesday) and myself and Ross there to represent KilkennyMusic.com in the Best Music Site category. Little did I think I’d be walking away with a trophy and a bottle of champagne to match! Then of course, little did Elly Parker think she’d end up wearing the bottle of champagne, but when someone sprays you in Formula One-style celebration, it’s only right to return the gesture. I’ve no idea what I said in accepting the award – nothing to do with the two pints and a tequila I’d had before taking my seat for the start – but the surprise was genuine and I apologise if I sounded like a babbling idiot on stage. Though photo evidence suggests that both Ross and Darragh have the acceptance on video. Seriously though – thank you. To the judges, to the other podcasters in the category, to Karl Deeter of Irish Mortage Brokers (category sponsor), to Damien and the web awards gang, Moviestar.ie (I’ve been looking for a new DVD player for ages), Darragh and Niamh for the roof over our heads for the night, to those of you who listen to the podcast and those of you who have yet to listen to the podcast (there’s plenty more to come!). Thanks to Ross as well, always nice to have one of your own share in something like that. Though I blame you for the tequila issues throughout the night. God help the Radisson staff… the look of sheer wonder and disgust on their faces at the same time. Winning an award aside, the IWAs was simply one of the best nights had out in ages. There were a whole lot of hugs, drinks, chats, random singing, dancing, eating (the food was outstanding), more drinking, more chats, more hugs (why all the hugging?) and finally getting to meet up with the likes of Eoghan, Robin and more. While it was good to catch up with familiar faces, the awards once again served as a fantastic outlet for connecting with new faces. Introductions were made, chats were had, ideas shared, plans revealed and batted around. Of course, like an idiot, I left the award behind me. Shows how much I was actually expecting to win! Having guarded it safely for the night and stashing it behind the couch on returning to the house from the hotel, I remembered to pack everything into the van… except the award stashed safely behind the house. While it gets minded in Dublin until Wednesday or Thursday, I’m going to pick out a shelf to hang and place the award on… it’s not all that often I pick up an award so I’ll treasure that one.